We visit Biltmore Estate in Asheville many times each year, and always get as excited as our first visit. Find lots of insider advice on our many Biltmore pages for things to do. Feel like royalty for a day at this 1895 French Renaissance castle built by George W. Vanderbilt. Explore the 8,000-acre estate, including the 250-room Biltmore House, 75 acres of beautiful gardens, the nation's most visited winery, shopping, dining, four star accommodations, hiking trails and more for a bucket list vacation to remember for a lifetime. Plan your trip with our 20-page Biltmore guide (see links to all the pages below). Save $100 on annual pass during April, $119/person. Buy online. May 24-September 29, 2019: See the Biltmore Gardens Railway elaborate model train display inside the Conservatory. Buy tickets on Biltmore's web site at least 7 days in advance and save $10. No promo code needed. Seniors age 65+ save $10 on regular adult daytime admission Tuesdays and Wednesdays. U.S. military saves $10 on regular adult daytime admission with Military ID. What's new at The Winery. Book a guided house tour or outdoor adventure during your visit and you don't pay the $25 upgrade for a second day on the estate. Stay at top-rated B&Bs, cabins and hotels. Most offer two-day tickets for the price of one. 1. 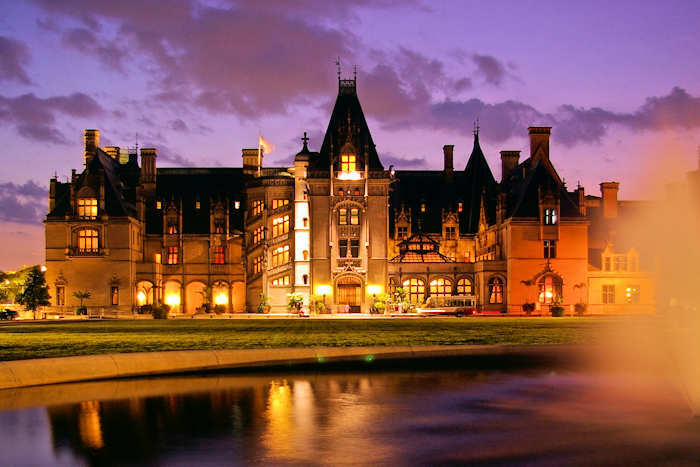 Biltmore House: Experience the wonder of Biltmore House, the largest privately owned mansion in America, with a priceless collection of art and antiques original to the Vanderbilt home. Since the house is a self-guided tour, we recommend getting the audio companion tour as soon as you enter the house. Excellent guided tours may be purchased to go "behind the scenes" (read more). After exploring the house, stop at the Stable Courtyard for refreshments or browse the shops. The Stable Café is great for sandwiches, burgers and salads. Allow at least two hours for the self-guided house tour. See our photos of Biltmore House decorated for Christmas. 2. Gardens: Spectacular gardens and woodlands are perfect for leisurely strolls. From the house, walk through gardens designed by renowned landscape architect Frederick Law Olmsted. The lush and beautiful reflecting ponds of the Italian Gardens are a fitting entry into a stunning world of garden paths. A short walk takes you to the four-acre Walled Garden, Azalea Garden and the Spring Garden. 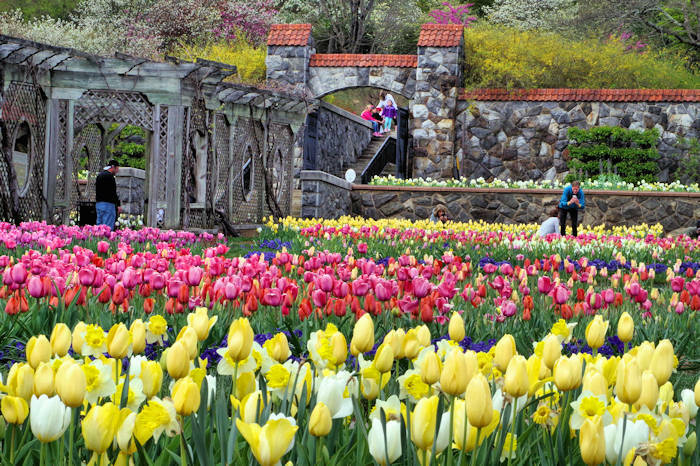 See our Photo Tour of the Biltmore Gardens and Biltmore Blooms Festival of Flowers Guide. 3. Conservatory: Adjacent to the Walled Garden is the tropical wonderland open year-round, complete with a big orchid collection. 4. Bass Pond: For a longer walk, follow signs to the Bass Pond to find a more secluded (and romantic) area, especially at the Boat House (above). In spring and summer, the Meadow Trail features wildflowers and grasses, while the Woodland Trail is ablaze with azaleas in spring. Get some exercise with your dog in Biltmore’s pet-friendly backyard of many thousand acres. 5. Photo Spot: Our favorite view of Biltmore House is along the drive from the house to the winery. Look for the small lake (Lagoon) on your left. There is a narrow unpaved road at the far end that crosses a small bridge for a stunning view of back of the House. It's a great picnic spot and place to take a hike. 6. Antler Hill Village: This mostly "new" village provides a relaxing place for dining, shopping and learning more about Biltmore history - a great stop after your house tour. It's home to the Winery and Farm (see below). 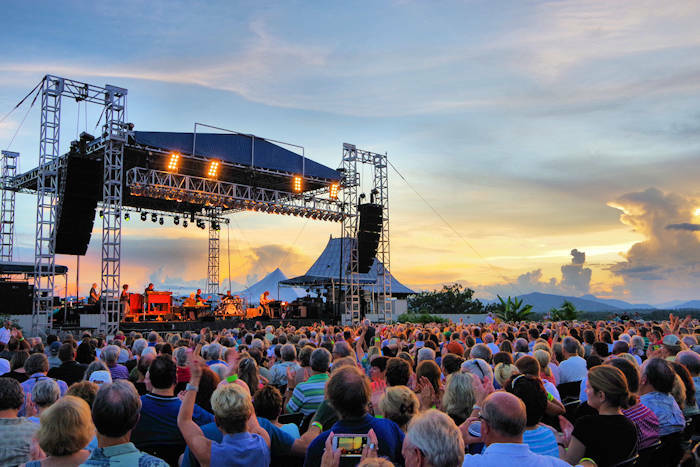 Enjoy live entertainment on the Village Green. See the special exhibits that rotate at the Legacy, and tour the historic barn. It's base camp for all outdoor activities, including the Land Rover Experience Driving School. Stay in two hotels, the Inn at Biltmore Estate and Village Hotel. Read more about Antler Hill Village. 7. Winery: Enjoy a self-guided Winery tour and sample Estate wines in the Tasting Room (both included with your ticket). 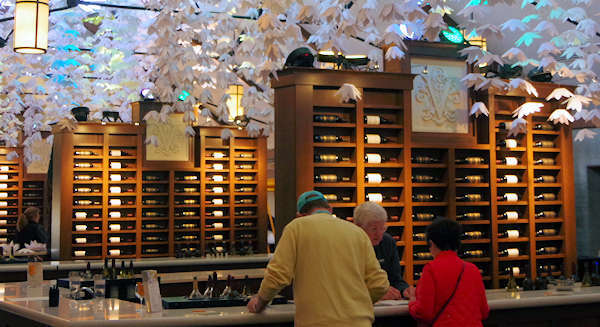 Browse the Wine Shop or dine at The Bistro. Check out cooking demonstrations and special wine tours and classes. For the VIP experience, take the Vine to Wine Guided Tour. New in 2018 is a Wine Bar beneath the clock tower. The Winery is open until 8 PM, so it's a great way to unwind after your busy day of touring. Read more about the Biltmore Winery. 8. The Farm: Learn about Biltmore's agricultural heritage at Antler Hill Farm, adjacent to the Village. In addition to displays of historic farm equipment in the impressive 1902 barn, meet draft horses, calves, lambs and chickens at the Farmyard. Watch the blacksmith or woodworkers. 9. Outdoor Activities: There is much to explore outdoors, including several great hiking trails and greenway. Read more about hiking and Biltmore outdoors. At the Outdoor Adventure Center, sign for an array of outdoor fun including biking, carriages rides, fly fishing, Segway tours, horseback riding, river trips and more. Go to the Biltmore website for more details. There are many options for dining during your visit. Since all of these are located inside the Estate, you'll need a ticket to reach them. All are open every day of the week. Read more about each on the Biltmore Web site. The Bake Shop has great coffee (opens at 8:30 AM), The Courtyard Market offers quick sandwiches, and the Ice Cream Parlor has picnics to go. The Creamery: Enjoy ice cream and Winky Bar sundaes. The Smokehouse: Located in the Barn with Carolina barbecue and Southern favorites. Take your time exploring. Plan to spend the day, or perhaps two. Wear very comfortable walking shoes. Arrive early (9 AM) to avoid crowds and to make the most of your day. Saturdays are the busiest days. The most crowded days of the year are Saturdays in April, May, October, November and December. Many dates (especially during the Christmas season) sell-out in advance. Bring a picnic or stop by the Ice Cream Shop outside the House to purchase a picnic to go. There are many great picnic spots on the Estate. If you arrive on the estate after 4 PM, your ticket can be validated for the next day at the Reception & Ticket Center. And you can usually add a day for a great rate. The grounds are perfect for walking your pets, but please make sure to keep them securely leashed at all times. Pets are not allowed inside the castle or other Estate buildings such as the winery, restaurants and shops. Each guest is assigned a reservation time to tour the Biltmore mansion on busy "Reservation Days" - read more below. 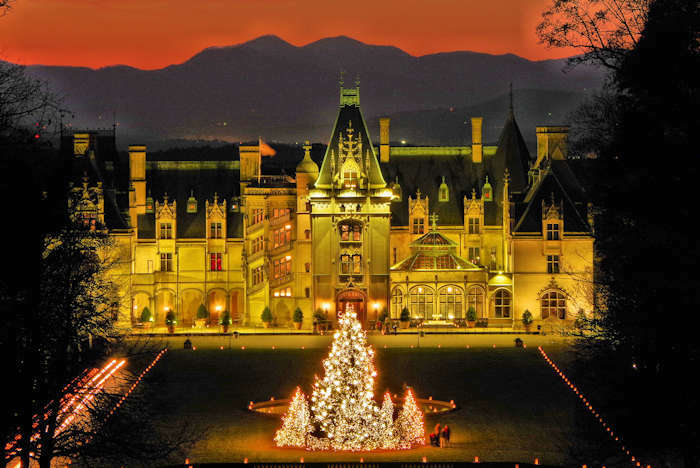 If you plan to visit in November & December, see our Christmas at Biltmore special guide. Find current deals and specials on Biltmore's Web site. Biltmore House Reservation Days: Reservations are required for your self-guided visit to the House on high volume days. You should reserve your entry time online at the same time you purchase your tickets. Or you can call ahead to get a time if you have a ticket or annual pass. You can also get a time at the Guest Services hut in front of the House. Arrive 45 minutes before your house tour reservation so you have time to park and catch a shuttle to the front door. Biltmore offers reduced-price admission to guests with disabilities. Parking assistance is available. They have some wheelchairs inside the house for guests at no charge for touring the first and second floors. At the gardens, park by the Conservatory for wheelchair access to the Walled Garden. Antler Hill Village and Winery are wheelchair accessible. Guests with hearing difficulties can request a Neckloop Telecoil Coupler, a printed transcript or sign language interpreter. Call them for your specific needs 1-800-411-3812. At the Antler Hill Farm, explore farm life with chickens, roosters, goats, horses and sheep. For the house tour, ask for the special kid's audio tour. There is no admission charge for children ages 9 and under. For GPS, use 1 Lodge St, Asheville, NC 28803. From Interstate 40: Biltmore Estate is located just north of exit 50 on U.S. Highway 25. From Interstate 26: take Interstate 40 East, then take exit 50. From the Blue Ridge Parkway: take the U.S. Highway 25-North exit; it is approximately 4 miles from the Parkway. Your daytime admission includes a self-guided tour of the House, gardens, Antler Hill and Winery. Ticket Prices fall into three categories (peak, regular, value) according to their busiest times. Adult full day tickets are $50-$75/person. Lowest rates are from January to mid March. Save up to $10 per ticket by purchasing online at least week in advance. See current deals and specials on Biltmore's website. Save by purchasing a Twelve-Month Annual Pass. The Estate is open seven days a week, 365 days a year. Hours vary at places throughout the Estate. The House is usually open 9-5 for tours. Note: Biltmore Village is located outside the Estate across from the entrance. Read more.